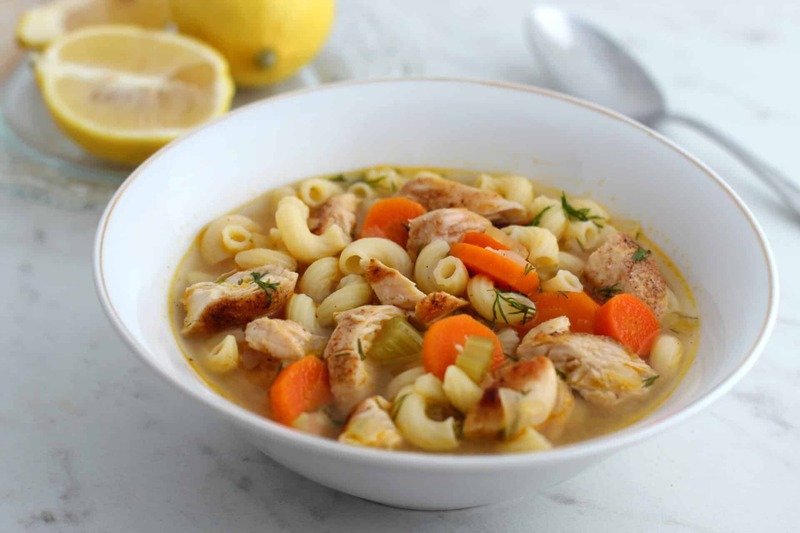 It’s funny that I’m writing about a chicken noodle soup recipe because I literally needed this meal in my life this week. I’ve been battling a cold for AGES. It’s going on two straight weeks. On the outside, I look pretty presentable. I am making it to functions – church, my son’s chess matches, my grandmother’s Sunday dinner. But on the inside, I am out of breath, dizzy, and utterly exhausted. My nose is a faucet that only turns on at night and in the morning and my body completely shuts down somewhere around 3:30 PM. Yesterday, I went to PetCo to get my dog a new leash and I literally almost fainted in the aisle. Can you imagine? My daughter had to walk me back to the car while my husband finished out our purchase. I don’t know what is happening with this current illness, but it’s happening! 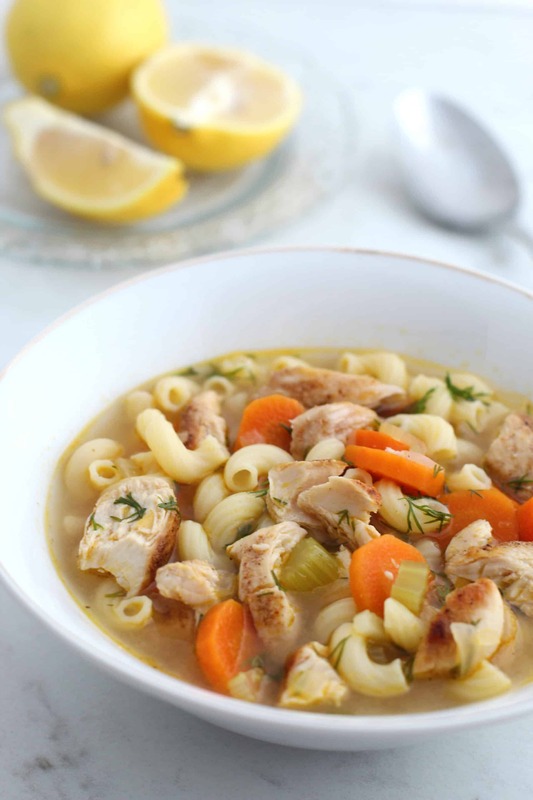 So yeah – this Chicken Noodle Soup Recipe is on the books! And I wanted to share it with you. I used to live with my mother and my grandmother. We had a pretty neat set up. My mother used to go to work and my grandmother would take care of me after school. Do you know to this day I’ve never tasted Chef Boyardee or anything like that? She was a “from scratch” kind of woman. I would wake to find her kneading out some dough and cooking the most delicious meals. My afterschool treats were grilled shrimps and that’s the TRUTH! I was spoiled. I really was – I see that now because as a mom of three I’ve never thrown so many goldfish and bars at people in my LIFE. But chicken soup is special. It warms your soul. It triggers beautiful memories. It heals. I don’t know WHY but it does. And while I don’t live with my grandmother anymore, I did need a little bit of her love this week. So, I decided that chicken noodle soup would do the trick. That’s why I’m sharing this recipe with you. Just in case you are feeling under the weather or know someone else who might have caught a bug. Heat oil in a cast iron skillet on medium-high heat. Add chicken and brown both sides, cooking until chicken is cooked through and juices run clear. 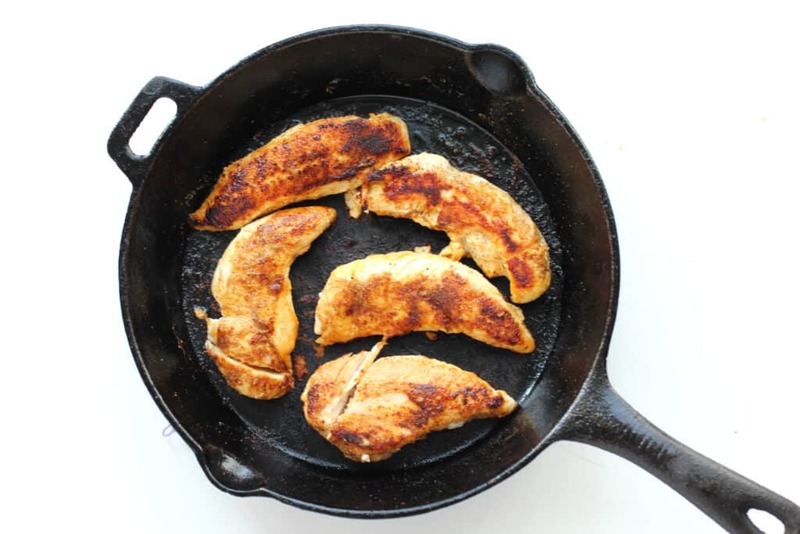 Allow chicken to rest for 2-3 minutes before chopping into bite-sized pieces. Set aside. Add carrots, celery, and onion to the stock pot – and stir to coat with oil. Cook for 8 minutes, stirring occasionally. 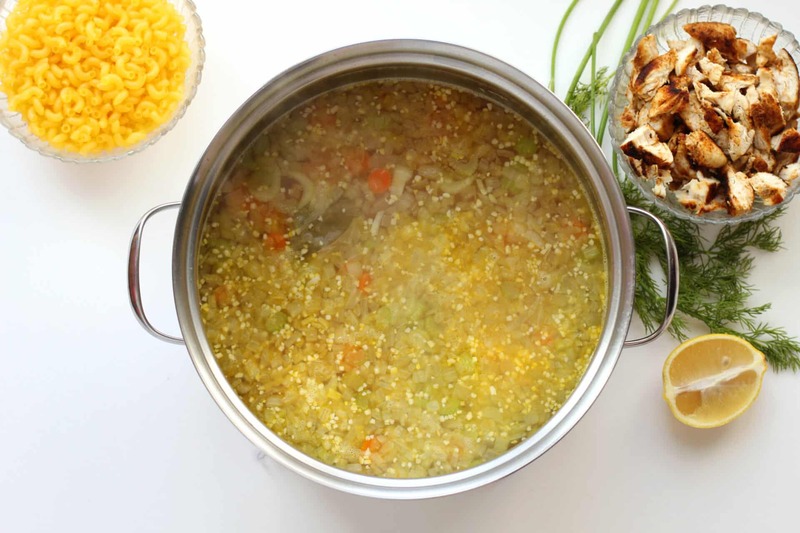 Adjust heat to high and bring soup to a boil. 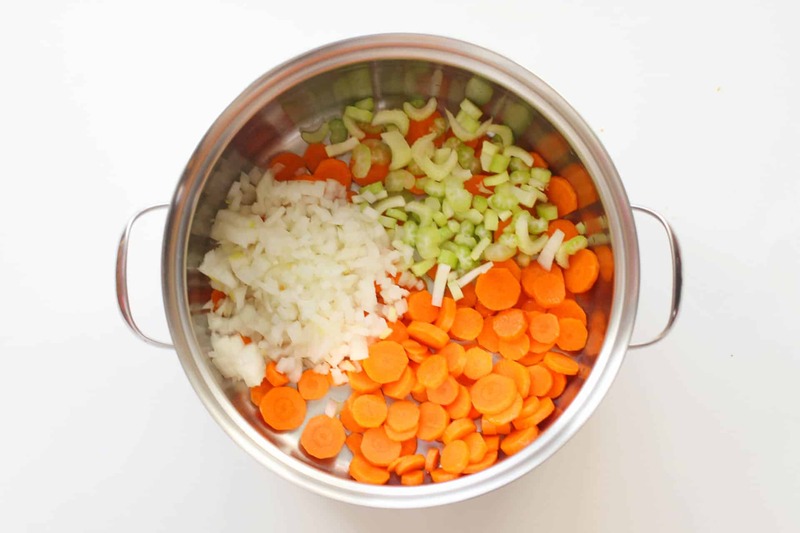 Once boiling, adjust heat to a medium-low temperature and simmer soup for 8 minutes before adding noodles. Taste broth and add salt if needed. Continue cooking according to noodle package directions to get an idea of doneness. 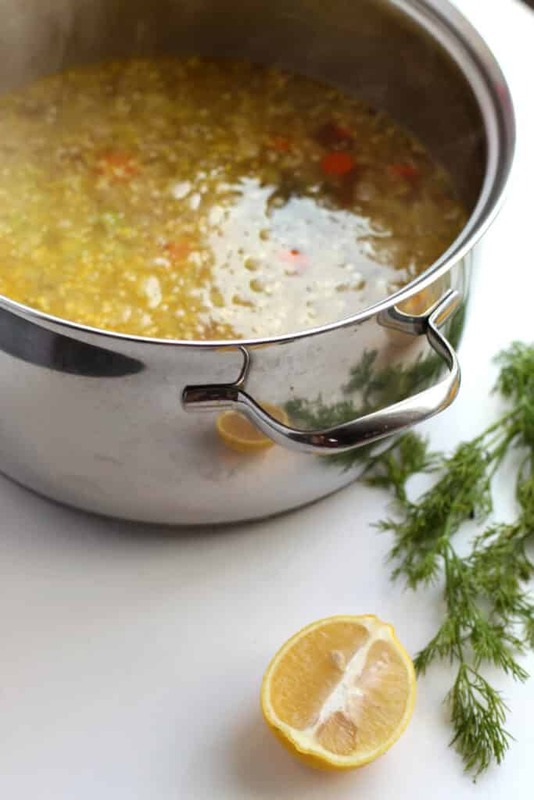 Once pasta is al dente, squeeze the juice of 1 lemon into the soup. 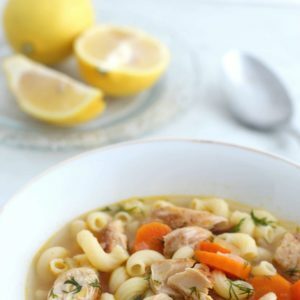 Stir in chicken and fresh dill. Serve.